​Sixt Lumber features a wide variety of windows for all of your building & remodeling needs. Enjoy warmer winters, cooler summers and quieter rooms. 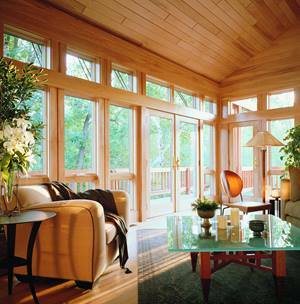 Porch windows with retractable screens offering panoramic views make it easy to capture natural airflow. Choose your windows based on your homes architectural style. Custom designs available to improve your homes appearance, increase its value & reduce energy bills. Sixt Lumber can help you explore the windows available that will provide years of comfort and beauty as well as being energy efficient and low maintanance. Our experts will help you find the right window for your home’s exact needs. Please call or stop by today and see for yourself how our family owned company can help you get your project done correctly and under budget. Atrium high quality, new construction and replacement windows are exceptionally crafted to be durable, easy to maintain and enhance the beauty of your home. ModernView utilizes the most advanced manufacturing methods and invests in a commitment to produce a product that will provide years of comfort, beauty, energy efficiency and low maintenance. EcoShield offers a wide array of replacement and new construction vinyl windows. Andersen®’s full range of beautifully crafted, energy-efficient, low-maintenance products are the perfect solution for your project. Ply Gem Windows offers a wide range of innovative, energy efficient and beautiful windows and patio doors. So, whether you’re building a new home or updating the place you’ve lived in for years, we have the style, material and performance options to match your needs, architecture and budget. The high-efficiency design can cut your energy costs and carbon footprint dramatically. The low-maintenance construction fits well with a busy lifestyle. And with the best warranty in the business, MasterView Windows are guaranteed to work beautifully for decades.